Core Media Inc. has been in business for over 37 years, with extensive expertise in the field of sports publishing and advertising sales. Our clients include the Toronto Blue Jays, Toronto FC, Maple Leafs, Raptors, Argonauts and Ottawa Senators. 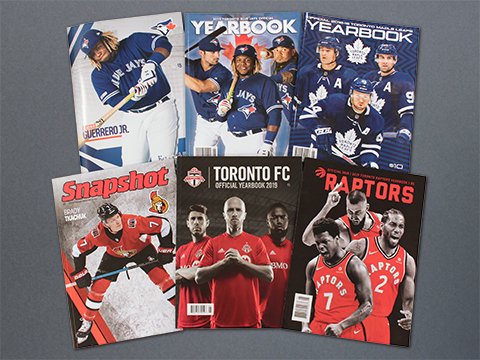 Whether as the official publisher or the exclusive sales agent of a professional sports property, our publications remain an effective and affordable way to reach the passionate, dedicated and loyal sports fans throughout Ontario and beyond. Many advertisers include our publications as part of their media campaigns in addition to utilizing them to enhance an existing team sponsorship. We at Core are very motivated to earn your business. You can count on us to work with you to build a package that not only meets your client’s needs, but exceeds their expectations. The quality of our publications sets us apart from the competition. Our standards are very high — the teams, their fans and our advertisers expect no less.